Have you considered these 7 factors with your Link Profile Analysis?Majestic Blog Have you considered these 7 factors with your Link Profile Analysis? The first aspect to consider is the status quo of your backlink profile, i.e. how are the incoming links to your profile classified and divided? Without being able to assess whether this is good or bad in an individual case, the profile should be evaluated in the knowledge that a certain degree of link volatility is natural. 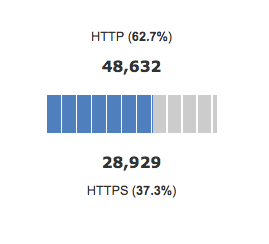 However, if the proportion of links marked as “deleted” in your own domain are very high, then it’s probably worth taking a closer look at this. The second consideration is about the ratio of the analysed domain links from subpages or starting pages. Since homepages are always considered to be the “most important” and “strongest” page of a domain, these links are on the one hand “sought-after”, but if a certain amount is exceeded, they can also appear unnatural, and if they appear unnatural then the links are more likely to harm your backlink profile in search engine ranking. The follow/nofollow view of the graphic shows the proportion of links that inherit link force (follow). Since there has also been the possibility since 2005 that external links do not inherit any link power, the share of this distribution is relevant – especially in a competitive comparison. Therefore, this breakdown should be included together with others in the overall view of the profile (e.g. together with “live”, “direct” etc.). One of the “classics” that should be looked at regularly and naturally when analysing your backlink is the type of backlinks which are coming to your site. The four most common types are text links, picture links, redirections or frames. Certain types of link shares are regarded as “normal” and usually, relate to the industry in which your domain sits. But all link types should be analysed in a competitive comparison. Generally, the proportion of text links is usually between 70 and 90 percent. In the above image, it is therefore very conspicuous that the link profile has an extremely high proportion of picture links. It is deliberately not evaluated whether this is disadvantageous or unnatural; it is purely a matter of being aware of the analysis. Simple reasons for an increased proportion of image links can be sponsoring activities, for example, in which images are mainly used as links. Brand anchor: “www.example.de”, “example.de”, “Example”. Miscellaneous: “here, “there”, “now, “click”. The aim of this subdivision and analysis is to understand whether a domain has been optimised very aggressively with regard to its links, whether it is linked to many “hard” anchors or whether it is rather “brand-oriented”. Among the top 5 are three brand echo texts, which is positive. There is also a money-anchor, which if isn’t known should be flagged. In addition, there seem to be a lot of links without defined anchor text. These backgrounds should also be analysed, as you could, for example, re-optimize them by contacting the domain owner and ask for a proper anchor text if the quality of the source is good (e.g. trust/flow values). However, it could also be automated links that are of lower quality. At position 10 you can see a “non-DE” anchor text. Assuming that the analysed domain is a DE-TLD, this seems strange and should lead to a deeper analysis as it could be harming your link profile. If you analyse a German-speaking domain whose business model is limited to the German market, for example, you can expect that this will also be reflected in the link profile. External references from other languages would therefore not be natural – which does not mean that they do little damage. Therefore, depending on the strategic orientation of the domain, the distribution of incoming links should be monitored with regard to their origin. If you look at other domains because you want to have a link from the domain, for example, you should also pay attention to the origin of the links in this case. The following figure shows an example of a domain that is only active in Germany. However, it is noticeable that about 35% of the incoming links come from English-language domains. Although the domain itself has a small proportion of English-language URLs, the proportion of incoming non-DE links appears to be too high, since 1.6% of the links come from other language regions as well. Of course, some of the English language links can be created by automated link generation. This often happens. Nevertheless, when checking your own domain or another domain on a regular basis, you should check the origin of the incoming links as a matter of routine. In addition, if you look at the link sources of the entered domain and select the option “Geo”, you get an overview of the domain names and their languages besides the information where the IP comes from. This allows you to quickly get an overview of which pages are monolingual, multilingual or – to stick with our example – not in German. Since the data can be exported, the overview can be exported easily to be further processed. Another view that should be regularly viewed is that of the historical evolution of backlinks such as the number of referring domains. Both views are basically concerned with monitoring the development on the one hand to monitor extreme changes (break-ins and rises) and on the other hand to evaluate the relationship of both processes to each other. The figure below shows steady growth for both counts up to December, which is almost in step with each other. Before December 10th, however, a clear increase in referring domains can be seen, while the number of backlinks – if on a different scaling – reacts much less strongly. In order to identify such developments and then enter into the analysis, these overview graphs are useful and should, therefore, be viewed regularly. In order to get an impression of how much your own link sources link externally and whether they are “left spin” or not, you can filter them under the view “referring domains” within Majestic. The domain list can be sorted primarily by “outbound external links”. A subsequent additional sorting could then be set for all outbound links (internal and external). In this way, you get an overview of the domains that link excessively to the outside world and can place this in a relation to the overall ranking. In the figure above, many domains appear rather questionable from a quality point of view. A monitoring in this respect can, therefore, be quite useful to see whether new domains are added here, which link “excessive” to the outside. 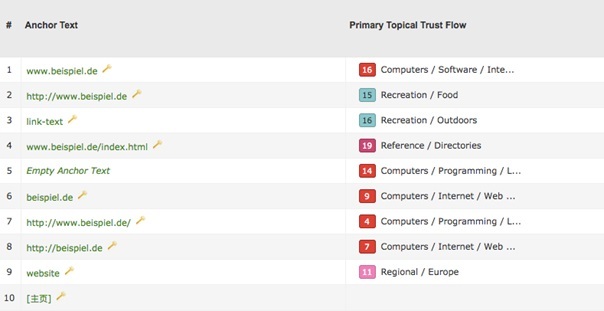 As a final consideration for link analysis, the composition of the Topical Trust Flow topics is worth noting, especially in a competitive comparison. Assuming that a link profile in the financial sector is composed differently from a link profile in the health sector, so should its sources for your link profile i.e. so analyse or monitor one’s own link profile in relation to the competition in terms of its composition. For the analysis of your own domain, this means to understand which topic you are in and whether this is reflected in the link profile. This should then be compared with the competitors to identify any anomalies; (as ideally you want your domain to reflect your industry). The domains from the above illustration are, for example, all e-commerce shops from the same industry. 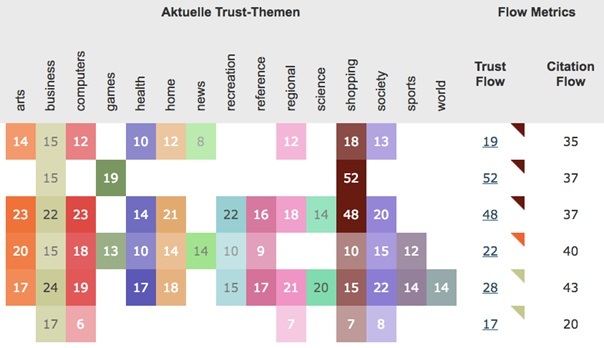 In addition to many thematic similarities with different weighting, there are some “outliers” such as “sports”, in which none of the analysed domains are active. These links could then be analysed in more detail as they could show a business opportunity i.e. perhaps a new market to reach if sites in these industries are linking to your site and information as there could be interest from these topics which is yet to be followed up on, or perhaps they indicate a risk as these links could be harming your link profile as they link to you without meaning or any relation. By comparing the backlink profile of your competitors this may also indicate potential markets yet to explore. Hopefully, that helps to explain some of the fundamentals to view when analysing your backlink profile and using Majestic. Hi, I have a question. But according to you, it is better to evaluate to understand if a link is good the CF and TF of the page that links us, or that of the domain? Example I have 2 links, one comes from the home page of a site that has the page TF = 19 CF = 28 so not bad, but overall the domain is not authoritative TF = 11 CF = 12. In another case the dominance is strong TF = 41 and CF = 49, but the page is weak with TF and CF = 0. in this case (juice only) which one is better? And the strong domain page, having the weak page, drops me TF and CF?